Last Sunday, my friend Elizabeth and I learned how to make the new hot thing in France. They are not actually so new. There is a company called Laduree that has been making them since 1862, although it was not until 1930 that the founder’s grandson dreamed up their present “double decker” form filled with ganache. Evidently they now sell 15,000 of them a day! If you have been through the Paris airport, you may have seen them and been tempted to try one of the tiny delectable treats – for a whopping 1.75 Euros! They come in all sorts of colors with all sorts of flavors and all sorts of fillings. It is a sugar lover’s dream. They have even become a fashion statement, with Lanvin creating a packaging and a new flavor (bubblegum!) for fashion week! Elizabeth and I took the class at Sur La Table as part of preparation for our next Excellent Adventure together. 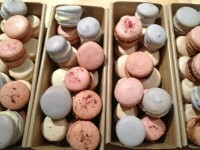 We made our macarons of hazelnut and almond floor. Some were tinted pastel pink, some violet and some left white. Some were raspberry flavored and some vanilla. All were filled with a creamy ganache of either praline butter cream, white chocolate or chocolate. And all were outstanding. In 2014, we aspire to lead a group of interested, able and willing clients on a special cooking tour to Maison d’Etre. Elizabeth will be the chef; I will be her sous chef. We will reveal secrets of the wonderful, regional cooking of SW France. We have scouted and already found some wonderful day trips. Near Maison d’Etre are a truffle farm and a saffron farm. Not far away are a lavender farm, wineries, and numerous, bustling, fresh markets where we will gather ingredients. Prize-winning food-travel author, Kimberley Lovato has written a wonderful book called Walnut Wine & Truffle Groves . We plan to use it for the backbone of our culinary adventure. Every attendee will receive his or her own copy. Think foie gras, duck, walnuts and black wine. Sound like fun? Mark your calendar for April of 2014… and send me a note if you are interested!